Duke Nukem 3D HQ sounds "Duke Nukem 3D HQ sound replacement"
The goal of which is to replace all Duke Nukem 3D (Atomic Edition) sound effects and Duke talk with either perfect matches or suitable replacements of higher quality than the originals. All of the Duke talk is done and a handful of sound effects but there is still a lot missing and some of the replacements are a little sub-par. Any suggestions, ideas, contributions would be freakin' awesome and totally appreciated. Rock on! That's some nice constructive and informative criticism there. Thank you. Nice! Awesome to see that there exists at least some high quality originals of some of the sound effects. The others that sound completely different feel wrong, though. Still, nice collection. I listened to about 40 of them. Good stuff. We'll see how well they work in the game. I've played with it through most of episodes 1-4 and to me it sounds just fine, though I am getting some weird sound issues when picking up the Atomic Health. This could just be my machine or it's a bug with this version of EDuke. If i understand correctly, it uses the teleport sound played at a different speed. I'd like to help you out with this project. I also talked to Jon St. John concerning this project and we are not allowed to use stuff from DNF sadly, but where do you get your soundfiles from ? Like this has ever stopped anyone before from using copyrighted material in Duke 3D. Hmm... Haven't noticed this yet but if you say so. 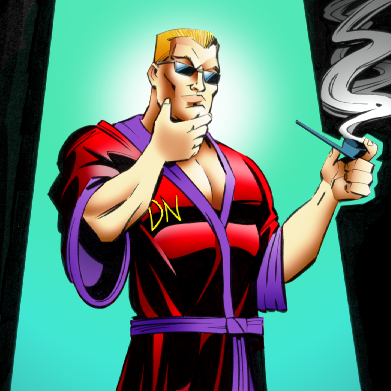 Well back to topic: Can't we use someone who sounds close to Duke Nukem and re-record the lines ? In your HQ sfx pack it seems that you use various sounds from a lot of different games. Unlike DN3Ds visuals and gameplay mechanics, the sounds of the game didn't get old during these years. Personally I think sounds should be dead last in the priority list to remake them for a HD version. There are a couple exceptions. Anything we can get the original CD audio quality of would go splendidly into a sound pack. Yeah it be nice if we knew where your getting each sound. and why are you using 8bit when you can use 16 bit voc files and sample higher? I'm thinking he only has the DOS version of Duke3D. Updated after a long hiatus. I chose VOC format for reasons of compatibility. I can upload WAV format if people want. Why not just make FLAC? So it can be used pretty much straight out of the box without any need for scripts (CON, etc.) and in theory compatible with original DOS version. For any foobar.voc, make foobar_voc.flac and EDuke32 will play it. EDuke32 supports automatic sound format upgrades which don't require any code, not con files, def definitions, or otherwise. For example, just place SQUISH.wav/.ogg/.flac in your root game directory, and the engine will automatically use it in place of the GRP's SQUISH.VOC. Same behavior works for the midi music. In the case of filename conflicts, i.e. SUBWAY.VOC and SUBWAY.MID, name your sound effect replacement as "SUBWAY_voc.ogg" so it targets the VOC extension rather than confusing it with the midi. I believe this is an accurate description of the system, although I mainly worked it out from this thread. In other words, there's no reason to use VOC format unless you're dead set on DOS compatibility. Blast and dash it all, ninja'd. VOC is such an archaic format. Just use FLAC. Nobody uses DOS Duke anymore. When you think HQ you think modern source ports. EDuke32. Make HQ work with the best of the best for max quality. Fine. I'll convert it to FLAC. EDuke32 supports automatic sound format upgrades which don't require any code, not con files, def definitions, or otherwise. For example, just place SQUISH.wav/.ogg/.flac in your root game directory, and the engine will automatically use it in place of the GRP's SQUISH.VOC. Don't seem to work for me, EDuke uses default GRP sounds no matter where I place the newly converted FLAC files. EDuke isn't the only Duke sourceport out there, even if it is the best and most well-known. How old of an EDuke32 are you using? Whoa easy there, man. Nobody's being hostile. The thing is if they're in FLAC the end user can convert down to whatever they need because it's lossless. The absolute top tier. HQ means the highest quality possible, ideally, and that's exactly what FLAC does. Even if EDuke32 didn't support it I'd ask for it....and I'd still be campaigning for EDuke32 to use it. Every other port should be using it as well. The more important factor is you can't use "HQ" and "VOC" in the same sentence and mean it. Updated my version of EDuke and it works now. VOC may be an old and outdated format but it is practical. And WAV and VOC are lossless too. Tried this and while not all of them are the originals of course, they do fit fairly well to me and sound like a much better HD sound replacement than what Gearbox could ever muster.